Over the last number of decades outsourcing and the use of third party service providers has become prevalent in the economy with many large companies utilising these practices to save money, increase profit and hand-over control of non-core activities to ‘specialist’ companies. In response to this workers secured protective legislation known as TUPE which secures, at a basic level, terms and conditions of employment and collective bargaining for trade unions. However, as these business trends have developed employers have found ways of overcoming TUPE by not quite outsourcing but instead allowing non-core workers wind down before contracting in a service provider or by using third parties where excess work exists instead of hiring more permanent staff. This has meant non-union often lower paid, or on worse conditions, workers are increasingly working alongside permanent unionised staff in large employments. The Communications Workers Union have sought to address this in former semi-state eir through achieving a service providers agreement which secures collective bargaining with service providers and also makes it a part of future tendering processes. And a sharing of relevant information on employee numbers, disciplinary and absence management amongst other items. 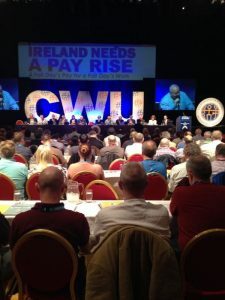 This type of agreement doesn’t represent a solution to either declining union density or the problems of outsourcing as an attack on workers conditions but it does provide a framework in which the CWU can seek to organise more workers and challenge the down grading effect that outsourcing and the use of third party providers can have on all workers terms and conditions of employment in the private sector but also the knock on effect on the public sector. A wave of workplace militancy has arisen in recent months which has produced a number of notable victories for trade unionists. The end of several years of muted opposition from workers to cuts to conditions and pay or doing more work without improvements in earnings – under the cover of ‘increased efficiencies’ – can be traced back to the industrial action by SIPTU members in LUAS in the early 2016. 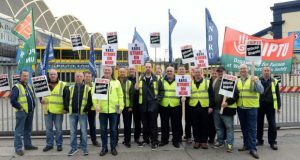 This protracted and bitter struggle resulted in a substantial pay increase for LUAS drivers, with the victory achieved in the face of unrelenting media attack. The win set a precedent for others workers seeking pay rises in the transport sector. It also showed that even in the era of austerity a determined, well organised workforce could overcome concentrated opposition from employers, the media and a degree of reluctance on the part of union leaders, to win a dispute. Dublin Bus workers won a similar pay increase after a series of strike actions in September 2016. This move towards a general push for pay improvement has also been evident in the manufacturing sector with many, if not the majority, of major companies granting above the rate of inflation pay increases without workers being forced to take industrial action. However, since the beginning of the 2017 the struggle on the industrial front in Ireland has moved away from solely a fight for better pay. During February, Mandate members in Tesco successful bridged a generational divide between staff in the super market chain, bringing out newer workers in a strike action aimed at protecting colleagues who had the benefit of superior contracts of employment that date back to the British retailer’s takeover of Super Quinnsworth in 1997. Ten days of strike action in several Tesco stores provoked massive public support and succeeded in bringing the company, that had seemed intent on pursing a union busting agenda, back to the negotiating table. This month an impressive show of force, which included a willingness to conduct all out strike action as well as holding well supported public rallies, trade union members in Dublin Fire Brigade would seem to have forced the management of Dublin City Council to back away from its plan to run down the Brigade’s ambulance service. Similar Bus Eireann workers’ willingness to take strike action has halted a management led attack on the concept of a national public bus service. Meanwhile, power workers at the Edenderry Power Ltd electricity generating plant in County Offaly have also declared a willingness to take strike action to force their employer to respect their right to collectively bargaining through their union. These victories and unresolved disputes, when coupled with the demand from public sector workers that pay talks scheduled for May result in significant pay rises, seem to point to the beginning of a new, more positive period for trade union activity. A growing concern is also evident among the managerial class that the narrative of the necessity for cuts, privatisation and the general push towards a low pay economy may no longer be acceptable to the general public. These factors combined may lead radical trade unionists to hope that we are at the begining of a new, better, period for working class struggle of a type not experienced since the onset of the partnership era in the late 1980s. It is incredible that, in the 21st century, union officials can be physically blocked from meeting their members in the workplace, especially given the crucial role trade unions play in workers’ rights, pay and conditions. As we are seeing in the Tesco attack on long-serving staff, strengthening the legislative rights of trade unions is key to supporting workers in their defense and enhancement of decent jobs and decent work. Sinn Fein are introducing a Bill to try change this. The Right To Access Bill will enhance the ability of workers to organise into unions and win better working conditions. The Industrial Relations (Right to Access Amendment) Bill will allow trade unions to work out a reasonable time with an employer for access to talk to workers about working conditions, health and safety, joining the union and much more. We have seen in recent years some unscrupulous employers using the law to stymie trade unions in their work. The purpose of this bill is to bring some necessary balance to the situation. What does this mean today, and how do we get there? Advance or retreat? The recent EU ruling on “state aid” by Ireland to Apple brings into sharp focus the related topics of sovereignty, ownership of the economy, and the right of the collective over the right of private individuals and corporations. On the one hand you have a European court telling Ireland we cannot give special treatment to certain companies, or provide state aid, or interfere with the market, as they have determined it. Essentially, we are not sovereign in our economic affairs. On the other hand you have the Irish Government doing special deals with an important American monopoly corporation, facilitating them in evading the already low 12½ per cent tax and illegally evading billions in much-needed tax while hundreds of thousands of citizens are in crucial need of state services. In many ways this reveals the position of Ireland within global capitalism: a former British colony shaped in every way by that status and essentially now an Anglo-American neo-colony, but within the European Union. We are part of the political and economic structures of German-French imperialism, the EU, but at the same time an important economic part of the US empire and its network of capital flow and companies. Our ruling class has one foot in each camp. When it comes to water charges they tell us the EU makes them do it, but when it comes to this present issue with Apple they say the EU can’t make them. The jingoistic ‘patriotism’ from FG/FF, egged on by the media, over this Apple issue is comical and does not fool our class, not this time I don’t think. But it does reveal the almost unique position of Ireland and the ruling class in Ireland. It isn’t a question of “good national” versus “bad international”; these are just frictions between the local domestic ruling class and its more powerful allies. And if we are honest we don’t deserve the taxes. The vast bulk of the wealth of Apple is created by poorly paid and treated Asian workers. Don’t get me wrong we should take the money, the State has colluded with Apple to evade tax but the money should be given mostly to those Asian workers who created it. To not have this as a position is to except that Ireland and Irish workers should benefit from the super-exploitation of those workers. It is to accept Ireland’s position within global imperialism and to support the extraction of surplus and capital from the east to the west which is a key part of the system today. The Irish ruling class, to avoid more class compromise locally, has made strong alliances internationally and so relies heavily on the EU and the United States to maintain its hegemonic position. It receives economic, political and ideological patronage from abroad to maintain its rule here—the alternative, of course, being compromise and an alliance with the working class to build a national capitalist development that challenges the hegemonic powers of others, such as can be seen elsewhere but that also opens the way for the necessary transformation and transition to socialism. The ruling class, the O’Brien’s et al, obviously don’t want that and so we have the final and complete victory of Redmondism. The politics and ideology of John Redmond are hegemonic in Ireland today. The Irish State is, and wants to be, part of Imperialism not in opposition to it. But the fundamental question of people’s rights versus individual rights and ownership is more crucial now than ever before. The world is on the brink of ruinous environmental destruction that is already killing off many species and does in fact threaten the reproduction of the human species. So this peoples’ right to the ownership of Ireland expressed 100 years ago is more crucial now than those who expressed it could possibly have imagined. The people’s right to the ownership of Ireland: how has such a simple and noble aspiration remained unfulfilled a hundred years later? Unfortunately, this seemingly apolitical value comes into conflict with the overwhelmingly dominant social and economic system, monopoly capitalism. It is an extremely political value; in fact it is the essence of class politics. Ownership. Private or common. Individual or collective. The small minority or the vast majority. 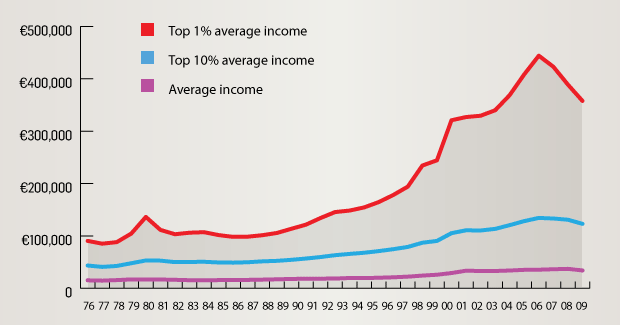 The 1 per cent or the 99 per cent. Workers versus the bosses. Sadly, we have probably never been further away from this aspiration than when it was written in 1916. Yet in other ways the crisis of monopoly capitalism, a crisis that is going on and on and seems unlikely to let up, potentially endless, creates opportunities to really push to achieve this right to common, collective and social ownership. I’m not going to list out statistics, or put forward a neat ten-point plan. There are many of these out there. There are many excellent critiques of the inhumanity, inequality and injustice of the world, as there are also many excellent alternative programmes and policy propositions. Instead I want to focus on the political economy of achieving this right. I want to look at the world as it is and how trying to achieve progress towards a system based on people’s ownership will present difficult options, repeatedly asking the question, Advance towards socialism or retreat to monopoly capitalism and the neo-liberal order? Mobilising the working class isn’t easy. The odds are stacked against us. But that has always been the way. It’s hard to imagine a revolution now in the classic sense of seizing state power in the midst of violent conflict; and so the immediate potential progress towards common ownership, for us in Ireland, is likely to be more gradual. This means that the question of advance or retreat is likely to be asked more often, in more subtle ways and not always in the form we want. Therefore, the need for greater political awareness and understanding within our class is even more necessary than during times of violent upheaval and near-zero-sum options. Each advance will open more contradictions and present more difficult questions, not as we would wish them but as a hostile global economic, political, media and military order presents them. There is no point denying this reality. We have to understand it and educate, organise and agitate our way through it. We, the Bolivian people, of plural composition, from the depths of history, inspired by the struggles of the past, by the anti-colonial indigenous uprising, and in independence, by the popular struggles of liberation, by the indigenous, social and labour marches, by the water and October wars, by the struggles for land and territory, construct a new State in memory of our martyrs. A State based on respect and equality for all, on principles of sovereignty, dignity, interdependence, solidarity, harmony, and equity in the distribution and redistribution of the social wealth, where the search for a good life predominates; based on respect for the economic, social, juridical, political and cultural pluralism of the inhabitants of this land; and on collective coexistence with access to water, work, education, health and housing for all. Right-wing and populist economic commentators love to reduce matters of the national economy to our family household situation. They are usually not helpful and actually are used to disguise the real forces at play. But let me try to present a useful one. My wife and I decide together, with some (limited) input from a seven-year-old and two three-year-olds, what our priority expenses are: what has to be paid for us all to continue as happily as possible. We pool all incomes and cover our costs. 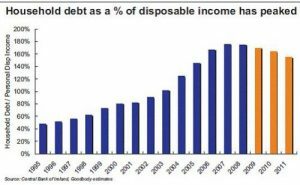 What we want to avoid, as far as possible, is loans, because we know that once indebted to these lenders, some legal but many illegal, we’ve lost control and we will be locked into debt, pay-back, exorbitant and penalising increases in interest rates, sometimes with the ultimate threat of repossession and violence. This is the situation we all want to avoid, even if we can’t always, but that many families face every day, because public right and welfare has been subordinated to private ownership and to private accumulation in a system called capitalism. Yet this state seems happy to exist on this basis. It goes to these money-lenders and, yes, it too faces the ultimate threat of violent action, often in the form of “austerity” programmes against us. Where the loan shark might seize my car or television, the international banks will seize a Greek island or public utilities. The same loss of control and sovereignty a family suffers when indebted to a loan shark or credit institution the state suffers when it is structurally indebted to banks, lending institutions, and the whole political, economic and military apparatus associated with this. The world is not as we wish it to be. Questions are not always posed as we wish them to be. Contradictions in the system and structures do not always give us an easy choice or option—take the Brexit choice as an example. The debate on Brexit was deliberately framed around immigration, and not democracy, sovereignty or public ownership as it should have been, and many on the left fell for this. Or what if, for example, we decided we wanted to fully fund and support a health service that marginalised and forced out private, profit-making health companies. This would no doubt lead to a breach of fiscal, funding and competition rules within the EU. But that debate and choice would no doubt be framed and presented in a hostile zero sum way with the full force of the establishment against the choice of public ownership. This is the reality of the world as it is. Democracy and the people’s right to collective and social ownership as a priority ahead of private ownership creates conflict with capitalism and with the global order. Pursuing a direction of the people’s right to the ownership of Ireland will quickly bring about the question of advance to socialism or retreat to the economic straitjacket of global monopoly capitalism. The question of “socialism or barbarism” is not just a moral question: today it is the question that capitalism presents us with if we want the human race to survice. 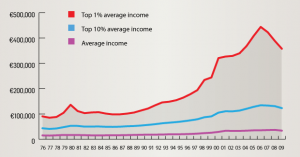 Monopoly capitalism has been stagnating for decades. Growth has been steadily declining and this is despite the opening up of former socialist countries as new markets. It’s profitability in real production has been squeezed. It suffers numerous crisis of over-production, over-investment, over-accumulation and under consumption. It moves jobs from the west to the east to cheapen production while at the same time undermining its purchasing and consumer base in the west. 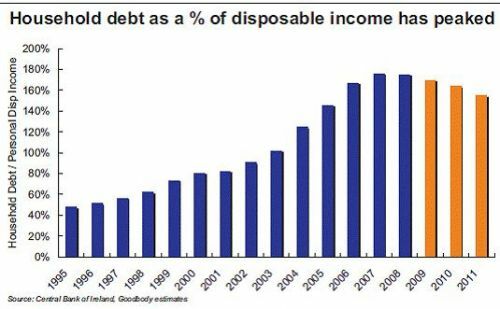 It creates more weird and wonderful financial investment products as a way of absorbing surplus capital which creates more risk, debt and bubbles in the system. It is now opening up and privatising virtually all avenues. Nothing is sacred any longer. That is why people campaigning for a nationalised public health service is a direct attack on capital, on its ability to reproduce itself. That is why proposing reasonable reforms in health or natural resources actually create the question of advance to socialism or retreat to neo-liberalism. Acknowledging and confronting this question head on and in the course of political mobilisation through serious political education is vital if we are to maintain the people’s, and in particular working-class, support when inevitably confronted with the question of advance or retreat. The world as it is is uneven. Class-consciousness, material productive forces and the balance of class power vary from country to country and region to region of the world. Progressive movements, as witnessed in Greece, will emerge in countries at different times, and they may have the opportunity to govern and therefor the opportunity to push forward and face the crossroads of advance or retreat. We have seen the failure of SYRIZA and should learn from this. They put forward mild reforms, and at the crossroads they retreated. This retreat has significantly damaged working-class power in Greece and has strengthened monopoly capitalism in Greece, Europe, and the world. But for SYRIZA to advance its initially proposed reforms would not have been enough, and further and faster advance to socialism would have been required for Greece to meet even the initially mild reforms put forward by SYRIZA. This is the era we are in. No single reform is enough, or will survive by itself. Each one will have massive consequences and so will require further reforms. To pay for policies and programmes, further nationalisations will be needed. To budget successfully, restrictions on capital outflows will be needed, etc., etc. With or without the EU! 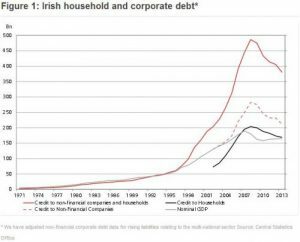 For those statements of 1916 and 1919 to be real and living, for us not to be trapped in a perpetual cycle of debt and money-lenders, we need to adopt a position of “with or without” the EU, the IMF, FDI, the United States, and Britain. If we choose a course of action that is democratically decided upon by the people that is opposed by the EU, or these other forces, then we must proceed without them and brave the consequences. This is what will make each question of progress one of advance or retreat, and make each change along the path of advance present new questions of advancing to socialism or retreating to capitalism. In all likelihood, whether it is repudiating certain debts, supporting public enterprise, or taxing a particular import or wealth category, our membership of the euro and the EU will become untenable, and we will need to lead a progressive exit. To advance towards a people-based economy and political structure means deepening a commitment to socialism during the mobilisation phase. This will require an understanding of short-term policies and longer-term strategic goals. It will also require, most importantly, addressing the issue of control and sovereignty of our borders over capital, labour, goods, and services. We must choose our issues wisely and the timing of advances, although often contradictions will emerge not as we wish or at the time of our choosing. At each point of change we need to be shifting the balance of power to labour if reform is to lead to advance and transformation. Each reform will have consequences that will need to be resolved through strengthening labour and workers’ mobilisation. This is the advance to socialism. Otherwise reforms will be illusory or temporary but will not deepen the people’s ownership of this country and its resources. In a hostile world, where our principles might suggest openness to us, often a more closed approach will be required. Understanding, explaining and winning hearts and minds is necessary, indeed crucial. Progress toward collective and common ownership will create conflict, conflict with those in power and in possession, and this must be understood if we are to achieve the radical Irish democratic and socialist tradition summed up by Pearse in the Sovereign People when he said, ‘The right to the control of the material resources of a nation does not reside in any individual or in any class of individuals; it resides in the whole people and can be lawfully exercised only by those to whom it is delegate by the whole people, and in the manner in which the whole people ordained.’ This remains the struggle and cause today. No retreat only advance. There are some common misunderstandings about unions that fall wide of the mark and lead to a lot of confusion; and some of this comes from within the movement itself and is given life by some unions’ language and actions. For example, a union is an insurance policy for workers when something goes wrong at work; it’s a professional representative body; it’s an interest group . . . These are all common answers to the question “What are trade unions?” but none are right. Trade unions are the collective and pooled effort and resources of working people coming together to improve the quality and standard of their lives. Unions are working people coming together in their own organisation, which they democratically control and run in their own interests. By coming together in an organisation, workers combine to give themselves extraordinary power. Their combined effort and their ability to withdraw labour (strike or industrial action) or merely act in unison (voting in a particular way, or a solidarity campaign) challenge the unequal relationship between labour and capital (workers and bosses) where the legal and political system inherently favours employers and those with deep pockets. Unions in Ireland go back as far as the 1700s, when skilled workers, such as butchers, printers, and bricklayers, came together to form their own organisations to win better pay and hours. They were at first illegal, and many of these early union activists faced prison or forced emigration for standing together for a better life. Over time, legislation was won, demonstrating that when workers are collectively organised they hold power not only in their own work-place or trade but also in the political arena. This legalised unions but provided increasingly complex regulations and hoops for workers to go through to express their power through action. Legislation has had mixed results for workers trying to act together to improve their lot. By the end of the nineteenth century, unions were growing and spreading to embrace many workers. In Ireland we had the growth of the ITGWU, a union for the mass of unskilled industrial workers. This exploded in numbers and influence as a result of the development of industrial capitalism and its victory over other previous forms of production. Connolly and Larkin led this organising drive, and this gave birth to the modern union movement in Ireland. As well as seeking to improve working conditions, the workers who organised themselves in the ITGWU had a political vision of socialism for Ireland, demonstrated in the Irish Citizen Army, the involvement of union members in both the 1916 Rising and the War of Independence, and encapsulated in the Democratic Programme of the first Dáil. The vision included national and public ownership of the fundamentals of the economy as well as the extension of social and economic human rights for all citizens. So far, this vision has never been fully achieved but there have been victories. Much of what is taken for granted today was won by workers fighting for it: the length of the working day and week; paid public holidays and annual leave; minimum payments and overtime; paid maternity leave; and much more. Like the laundry workers, members of the Irish Women Workers’ Union, who went on strike in 1945 for a second week of paid annual leave, their victory led to other unions claiming the same, and the two weeks became the new minimum for all from the following year. This combination of a radical political vision of society and militant work-place action saw the trade union movement grow from tens of thousands to close to 200,000 workers by the early 1920s. 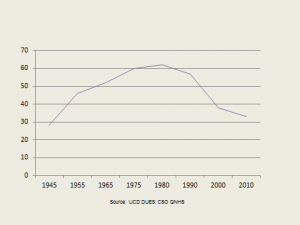 Growth in employment over the decades has moved the movement to about 700,000 members in the whole of Ireland; however, union density (our percentage of the entire work force) has been declining from its peak in the 1980s when it reached 62% (higher than both Britain and the EU average). Today it stands at about 35 per cent, with the private sector at about 21 per cent. This decline is related to the second wave of foreign direct investment which has largely been US and anti-Union. The State has ceased promoting union recognition in early stages of start-ups of large multi nationals and now actually promotes the non-union environment as a positive. But this culture has also affected Irish business with the 3 high-profile union recognition strikes in the 90’s in Pat-the-Baker, Nolan Transport and Ryanair not ending well for the union movement and has also emboldened large Irish employers like Dunnes Stores to continually refuse to recognise the trade union of their staff. But these are external factors and the movement itself has a lot to answer in terms of this decline. Trade unions do not develop or act in isolation from the political and economic realities they find themselves in. Unions are influenced by, and play a part in, the society around them. The last few decades have seen the development of a political, economic and ideological environment that is increasingly hostile to unions and to collective values. Governments, the media and international institutions have led this assault. The economic and political establishment have correctly viewed unions as an obstacle or challenge to capitalism and the maximising of profits for shareholders and of salaries for senior executives and so have set out to weaken and discredit them. Margaret Thatcher famously declared, “There is no alternative,” and, as society generally has been fed this line, so too unions have, to a greater or lesser extent, accepted it, or lost their belief in an alternative. Unlike a hundred years ago, when some strong unions had a radical and independent vision of society, many unions now have been relegated, and have relegated themselves, to being “managers” of change. Unfortunately, this puts the union into a position between member and management, as some kind of arbiter or mediator, rather than fulfilling its function as the worker-owned structure in which members can act collectively to win. This has developed what is often called the “servicing” model of trade unionism. Returning to the first line of this article, the union is viewed as an insurance policy, a service to workers, not a workers’ collective. This means that the union official is usually the first port of call for sorting out issues in the work-place, rather than the workers themselves being organised to do so. Union officials lodge grievances and pursue issues through processes; the industrial relations process becomes the priority, not collectively organising workers together. Now, however, more and more unions are at least talking about returning to the original approach, the “organising” model. 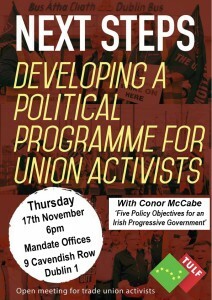 This puts the emphasis on activism by members, both in the work-place and in the structures of the union: workers acting together, making the decisions on what is best for them, negotiating in the work-place, insisting on collective bargaining and union recognition, with the officials and other union resources there to advise, support, assist, co-ordinate, train and ultimately empower workers themselves. And that approach doesn’t end at 5 p.m. or finish in the work-place: workers have common issues outside work, such as water, housing and health, transport and taxation, and so the organising approach seeks to empower workers to fight, and on all their issues and concerns. Workers are people, not a cog in a machine, and so collective power enables workers to take on all the issues we face together. 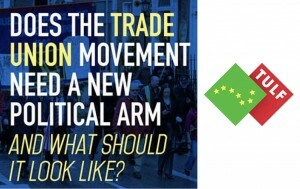 This turn to empowering workers locally is more urgent than ever now, as we see a renewed assault on unions internationally, in both the British Trade Union Bill and in the United States in new legislation and a variety of legal outcomes there, through many high profile ECJ rulings and also through CETA/TTIP. And so if unions—and, more importantly, if workers who make up unions—are to survive and enhance their power in society, then workers must be encouraged, supported and resourced to do it themselves. The law, political parties or industrial relations institutions won’t deliver this unless forced, but workers can, just as they have in previous centuries. To do this, union structures cannot be ignored. They might be boring; God knows they can be tiresome and draining. But they are important. All unions have structures, some more open and democratic than others, for members to be active in and to decide the direction of the union. Workers must win these structures to change the union. Class-conscious workers must win these structures to politicise the union and strengthen the demand for workers’ control and empowerment. There are more than fifty different trade unions in Ireland, representing workers in practically every walk of life. The Irish Congress of Trade Unions is the umbrella organisation for our 32-county movement, the biggest social movement in the country. Trade unions are, by and large, governed by their members. Members can go forward for election onto the various committees that represent the members on a geographical or sectoral basis. These are commonly known as branch or sector committees, or sometimes regional committees. The governing body of a union is its National Executive Council, Executive or General Council, depending on the Union. These unions reflect the diversity of views of any large group of workers. 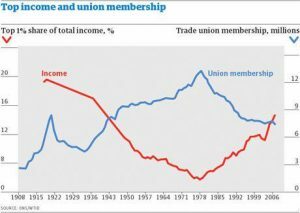 There are no good or bad unions per se, it is just that they reflect the left and right-wing views/traditions of their members and of those groupings that are more organised and hold positions within the union. So, just as class struggle, ideological and material, is necessary to advance the cause of workers within society, so too it is necessary within unions themselves. There can be a misconception that struggle within unions isn’t a necessary part of the broader struggle. But actually it is possibly at the present moment the most important battleground for workers in order to win their movement, and unions, to progressive, class-based organising and away from the servicing culture, ideology and model of the last few decades. Members influence the direction and policies of their union by putting themselves forward for election to branch or similar committees, then progress further as committee chair, secretary, officer or president or, ultimately, becoming a member of their NEC. Members should be supported in this and provided training and encouragement. Often, however, if a member is not of the dominant political leaning of the union they will have to struggle without this support and so will rely on their allies and comrades on the ground to win. The Trade Union Left Forum is a resource for left activists to use. We can help you with ideas and materials to win support. Winning elections and positions within the union, based on the membership strength, is a vital part of realising the potential of the union and the movement. The public face of a union’s leadership is usually the general or national officers: president, vice-president, and general secretary. These will vary in title in different unions. They are usually employed officials of the union who have been elected/appointed by the members to hold these positions for a limited number of years. Furthermore, the officers are accountable to the NEC, the committee of volunteer members elected by the members, representing the different sections of the union. All policy-making decisions come through the members of the NEC. Each union has its own rulebook or constitution, which governs procedure on such matters as elections, decision-making, handling disputes, the quorum for committee meetings, motions, policies, frequency of meetings, and so on. This democratic process is ensured through adherence to the rules. Understanding and using your union’s rulebook and constitution, although possibly boring, is crucial to winning your union. In accordance with their rules, all unions must hold annual or biennial delegate conferences. Delegates are members who are active in their union as shop stewards or in other roles and are nominated by fellow-members of their branch to represent the views and wishes of the branch or employment area. Each branch can propose motions to the conference on issues they consider most important, such as privatisation, water provision, the health service, pensions, education, pay, international solidarity, political party affiliation and so on. These are debated and voted on, to be accepted or rejected by a majority of delegates. In this way the membership decide on the direction and policy of their union. But experience tells us that to give meaning to motions members must continue after the conference to put forward plans and ideas for action and initiatives in order to breathe life into what the conference decided on. Local union branches or committees should themselves take initiatives on specific motions they support. Often motions lie dormant and hidden because of both the conservative ideological leaning of the current union leadership but also, more importantly, the lack of an organised left bloc within the movement. As class-conscious trade unionists we see the purpose of trade unions as being to build working class industrial power through the collective organisation of workers and to act collectively to counterbalance the power of employers and their Governments. Acting on the principle of solidarity, people support each other on the grounds that if something hurts one of us, then it is likely to hurt all of us in time. If you want to influence the biggest social movement in the country, find the relevant union for you and become actively involved. Build alliances with like-minded people around a progressive agenda, and make change happen through activity and ideas. Politics and ideology are not dirty words for us: they are the life of our class and must be reclaimed and reinvigorated if we are to win our movement and win a better, socialist future. The TULF will shortly launch a political pledge campaign to better coordinate and organise left class-conscious trade unionists across Ireland. There has been, and still remains, a tension within all trade unions between those who represent a relatively narrow “trade” or “craft” consciousness and those who represent a broader political class-consciousness. There is also conflict and tension within unions between socialist (organising mentality) and social democratic (servicing views) ideologies. We need workers not only to join but to get involved to win our unions and to deliver the full potential of this collective movement and resource for working people to bring about socialism in Ireland. The TULF aims to help and be part of this. Together we are strong; divided we fall. There was agreement at the last TULF meeting that a common political programme for left trade union activists is a necessary step forward. 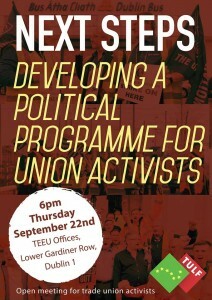 We hope this meeting, open to trade union activists, can help develop a common political programme. This forum meeting has no set speakers and is open to all to bring ideas and programme points for consideration. To trade union activists the question may seem stupid, but it does illustrate how far from a political force trade unions have become. That question would never be asked of IBEC. The answer to the question is quite simple really: Mandate Trade Union members have won €36 million in pay increases over the last four years, but then the government comes along and with the stroke of a pen takes €27m from their pockets through water charges. To protect workers’ incomes, Unions have to be active on the political and industrial field. In addressing the question posed by the Trade Union Left Forum, Does the trade union movement need a new political strategy? One must ask whether the trade union movement actually has a political strategy, and whether that strategy is working. Ireland has the second highest prevalence of low pay in the entire OECD – only lagging behind the USA. Ireland has the second highest prevelence of involuntary part-time workers (low hours and zero hour contracts) in the EU15 – behind Spain – with more than 100,000 workers seeking more hours at work but being denied them. 2,121 children are homeless across the State with more than 70 families losing their homes every single month. Irish class sizes are the second highest in the EU with 25 pupils per teacher compared to an average in the EU of 20. 10 percent of people living in Ireland experience food poverty. Ireland has the highest level of fuel poverty in the EU. Ireland has the highest excess winter mortality rates in the EU with the most recent number seeing 2,800 deaths mostly among poorer communities. 12% of those at work are living in poverty. 36% of Irish children experience multiple deprivation. Ireland still does not have collective bargaining rights. There is no trade union education on the school curriculum despite 95% of students moving on to become workers rather than entrepreneurs and almost all teachers in the State being members of a union. 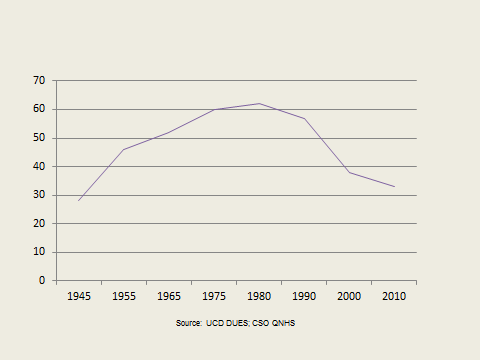 Trade Union density in Ireland is edging towards its lowest point in 100 years. So if there is a trade union political strategy, it doesn’t seem to be working. The problem is not that trade unions don’t have a vision; it’s that they have no way of having their vision implemented. Unions are politically weak, relatively speaking. The mainstream political parties do not fear the trade union movement as they should. If they did, why do we have among the weakest workplace rights in the EU, and why can’t we have our policies implemented? Just look at pre-Budget submissions for an example. Since the economic crisis began in 2008, Unions have been more-or-less right. We argued for wealth taxes; more investment; no cuts; and all adjustments to be made at the top end of the income ladder. ICTU said austerity would cost jobs, increase poverty levels, destroy communities, increase emigration, etc, etc. But all pre-Budget submissions were glanced at, and then swiftly thrown in the bin. Instead the groups that had their policies implemented were the American Chamber of Commerce, IBEC, Irish Bankers’ Federation, and the Small Firms Association. The media has a role to play in this too. They give much more airtime to business lobby groups than they do to workers’ representatives. When the Low Pay Commission recently recommended a measly 10c increase in the minimum wage, RTE’s online coverage gave space to three business groups for quotations (Chambers Ireland, IBEC and the Small Firms Association), one civil society group (MRCI) and the Fine Gael Minister. Not one trade union was referenced despite Mandate, Unite, SIPTU, ICTU and others all issuing press releases. In October 2014, the month of the first Right2Water National Demonstration which was hosted by a number of trade unions and was one of the largest protests in Irish history, Pat Kenny had 104 guests on his show. During the whole month, only one guest (less than 1%) came from the Trade Union movement. However, there were 20 journalists, 16 business people or public relations professionals, 12 classified as miscellaneous, 8 politicans, 8 cultural, 7 writers, 6 campaigners, 5 doctors, 2 sportspeople and 1 priest. So one of the major challenges is getting the trade union message out into the public domain. But what is that message and what is the strategic objective of that message? “The policy to which James Connolly subscribed in 1914, viz: – ‘That in any parliament to be elected in Ireland Labour must be represented as a separate and independent entity, having no connection with any other Party or Parties in the Legislative Chamber’ is as sound now as it was 16 years ago. “The success of the industrial wing of our movement must, therefore, continue to depend largely on the strength and efficiency of the political wing. On the other hand, the political side cannot ever hope to become an effective force in this country unless it has behind it the driving power of the Trade Unions. That attraction to the “more spectacular field of politics” is still a major issue now where many within the movement appear to be political party members first and and foremost, and trade unionists second. 25 years after the above was written, the frustrations of a failing trade union political strategy were illustrated in the Irish Union of Distributive Workers and Clerks’ (Mandate Trade Unions’ predecessor union) Annual Report (1955). The argument they were making in this article was for trade unions to engage in the concept of worker cooperatives. More importantly, they were talking and debating about a political strategy to vindicate their objectives on behalf of their members, something that appears to have been absent from the trade union movement for quite some time. Over the past 20 years, due to much demonisation by the mainstream media, the business community, by members of the public, and in some cases, due to the actions/inactions of trade unions themselves, the trade union movement has lost much of its support in working class communities, its traditional home. Instead, trade unions – partly as a result of social partnership – are now seem as professional associations rather than community organisations. Hypothetically, though, what would Ireland look like if it had been ruled by trade unions for the last 100 years? That motion took 80 years to come to fruition in 2000. That motion has never been adopted by any Irish Government and has led to thousands of trade union disputes as employers continue to cut terms and conditions of employment without agreement. The motion was amended by the Irish Manufacturers Agents and Commercial Travellers’ Branch to insert the words “and optical” between ‘dental’ and ‘treatment’. In an addendum by the Tralee Branch, after the words ‘16th birthday’, the words ‘and also for non-working wives of insured persons’ was added. So now you have a resolution, following a democratic debate among retail workers from different parts of the country, that gives children and partners of workers free dental and optical treatment. Many will look to trade unions today and say they were different in the past. 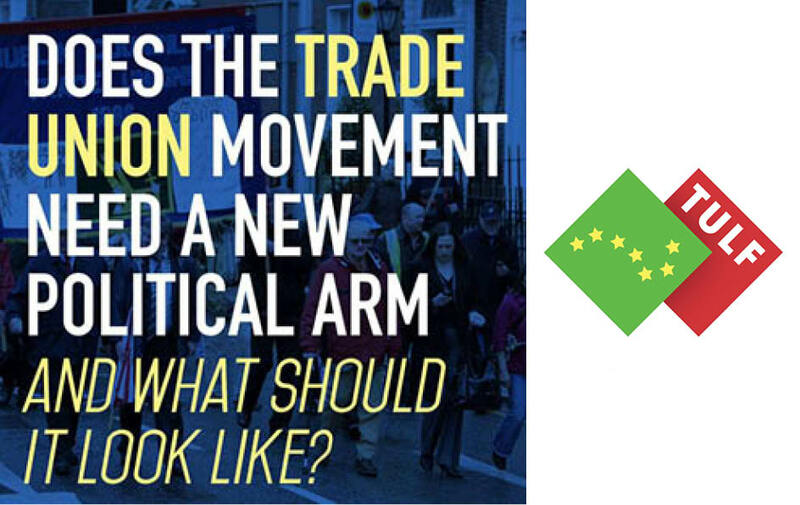 However, if you look at recent policies adopted and positions taken by the Irish Congress of Trade Union’s (ICTU) in recent years, if they were in government, Ireland would not be supporting TTIP or CETA. Zero hour contracts and exploitative low hour contracts would be banned. Water charges would be abolished and increased funding would be made to upgrade the water infrastructure from general taxation. Lone parent’s cuts would not have taken place. We would have a higher minimum wage with an introduction of refundable tax credits which would benefit 240,000 of the lowest paid in the country. Generally, Ireland would be a more equal and fairer place to live. So it isn’t that the Irish Trade Union movement hasn’t identified a programme, it’s that it doesn’t have the capacity to have that programme implemented. Why is that? There are different models of affiliation around the world. In Ireland, only SIPTU and the TSSA are affiliated to a political party, the Labour Party. For their affiliation they do not receive automatic seats on the National Executive of the Labour Party, but “affiliated Unions are entitled to send delegates to Party conferences.” The number of delegates varies according to the size of the Union but their allocation is approximately 50% smaller than that of a regular branch. At the last Labour Party conference, there were reportedly between 900-1,000 delegates, of which approximately 11% came from affiliated Trade Unions. Contrast this with the UK. Over there the affiliated Trade Unions have a guaranteed 12 seats on the National Executive out of 33, and they are by far the largest group. They also elect 50 percent of all delegates to the Labour Party Conference, which is where Labour Party policy is developed making the Trade Unions heavily influential. Some Unions who are not affiliated to any political party send positive communications to members about a party/parties which their leadership or NEC supports. They sometimes do likewise in reverese, where they are critical of particular parties. An example of this is the Right2Change Union strategy where policies were developed – like Right2Water, Right2Health, Right2Housing, Right2Education – and political candidates were asked whether they supported those policies. The Unions then asked all political candidates whether they would work together in government to have those policies implemented, if the numbers allowed. They then published the supporters of the Right2Change platform in order to educate members and the public on who supported this egalitarian platform. Which of these strategies is best should be up for debate within every trade union in the country. However, while that discussion around political representation takes place, trade unions need to build a movement that functions cohesively and addresses the industrial and political challenges that face our members. 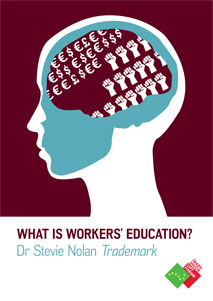 That movement should have strong research and education functions focusing on political economy as well as tradition trade union courses – something NERI and Trademark both provide. It should build alliances in communities and among civil society groups. It should have a communications strategy that acknowledges and addresses the hostility of elements within the mainstream media. It should also consider the political, economic and industrial leverage it currently has in order to achieve its goals. It should then decide on what type of political representation it wants, if any. The good news is, there has seldom been a better time than now to have this debate. Civil War politics appears to be coming to an end with Fianna Fail and Fine Gael at their lowest combined electoral outcome in their history (49% of first preferences, down from a high of 87.4% in 1982), and with shared resources, new media opportunities – including social media, improvements in outreach (email, sms, etc), increased levels of community activism – if courageous action was taken by the trade union leadership, it could affect real change. We’ve seen something stirring with the Right2Water campaign in Ireland, and with the movements for progressive change behind Corbyn in the UK, Sanders in the USA, in Greece, Portugal and also in Spain. People are crying out for a new politics. There has never been a more opportune time, the question is, how do we get there – or will we let the momentum slip? Maybe the next TULF meeting might help to answer that question.